When a serialized work evolves into something distinct from its initial form, it can sometimes be hard not to miss the bits it shed in order to make room for what it became. Is it a creator’s duty to maintain the work’s original aim, or to at least guide its evolution in a way that will mitigate any disappointment on the part of the audience? Certainly not, but it does call into question whether it’s a good idea to keep referring to it by the same name. 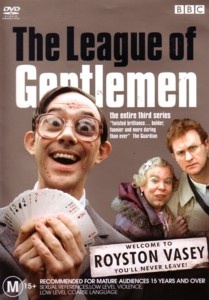 This, as you may have guessed is the difficulty I’m having with the third season of League of Gentlemen, a season with big differences from the two that came before it. In my view, so far, there are two departures of note: the absence of a laugh track and the relative mundanity of the characters. The inclusion of a laugh track in the early seasons was something that took getting used to for me. Distracting at first, but once I was able to tune it out it became a part of the ambience, a part that brought out the humor/ horror juxtaposition I previously discussed being central to the show. Without it, we’re no longer watching a network comedy gone delirious, we’re watching something delirious of its own free will, which is much less exciting. Although it might stand to reason that this would free Gentlemen up to extend the boundaries of its insanity even further, it opts for just the opposite. This season consists of human interest stories- characters fall in love under difficult circumstances, experience career setbacks, and maintain extra-marital affairs. While those elements were always presented in the show, they now dominate it. Royston Vasey is no longer home to the monster children of deranged shopkeepers, menacing circus demons, and malicious psychic twins of seasons past. Where these characters had their roots in nightmare, season there’s characters have their roots in reality. The thing that compensates for these loses somewhat, and what I imagine what the show’s creators intentionally sacrificed these things in order to achieve, is deeper stories that relate more directly to humanity. And it’s certainly not a failure on that front. But with the depth of its comedy and the heights of its insanity cut off, you’re forced to wonder if it’s really the same show.